On Friday 7 June 2013 millions across the globe will have the unique opportunity to embark on a guided underwater tour of one of the world’s greatest natural wonders, the Great Barrier Reef – all from the comfort of your own home. The ReefLive event will amaze, delight and educate a global audience through an innovative live broadcast highlighting the importance and vibrancy of our oceans. 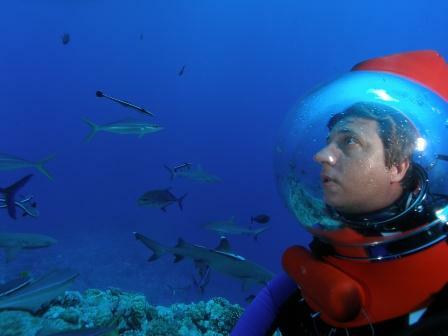 The 12-hour interactive broadcast will be hosted by internationally acclaimed marine biologist and underwater cinematographer Richard Fitzpatrick (above), who will speak to the audience from underwater at one of his favourite dive sites on the Great Barrier Reef. 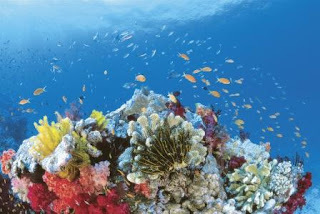 An initiative of Tourism and Events Queensland, ReefLive is being held in conjunction with World Oceans Day (8 June) and is an opportunity for those who love adventure, the ocean and nature to get a new perspective of the Great Barrier Reef and learn more about this unique ecosystem. Queensland Tourism Industry Council Chief Executive, Daniel Gschwind. ReefLive will feature broadcasts from both the underwater reef studio with Richard Fitzpatrick, and a land studio via Google + Hangout. The ‘Hangouts’will be broadcast simultaneously on YouTube live via the Tourism and Events Queensland channel and the audience can also interact with the divers and the panel via Twitter using the #reeflive hashtag. Tourism and Events Queensland are also giving Facebook users the opportunity to win a Great Barrier Reef Experience worth $10,000 AUD. Enter the 'Meet the Reef' competition by creating your ideal Great Barrier Reef experience. WHEN: ReefLive will broadcast from 1am GMT to 1pm GMT on Friday 7 June 2013, and coincides with World Oceans Day on Saturday 8 June 2013. WHERE: Online via YouTube. Watch #ReefLive here. The eyes of the world will be on this incredible event. Enjoy the #ReefLive broadcast. If you like what you see, please contact a member of the Dive Dream Team to discuss your Queensland diving holiday options. Call us on 0845 130 6980 or Email us by clicking here.